The racking is fitted on guided mobile bases with the aim of reducing the number of aisles and increasing warehouse capacity without losing direct access to each pallet. Each base is motorised and fitted with mechanisms to enable movement, electronic equipment and safety systems in order to guarantee safe and efficient operations. These systems can be installed to function manually, by remote control or by computer. 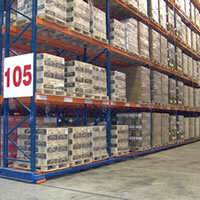 Any type of racking can be used with mobile bases.